A picture post for Thursday afternoon. I love the shape that Phillip at St Crispin’s has got into the waist of this Dainite sole. Phillip has been taking orders at Drake’s for his St Crispin’s shoes this week. Don’t worry if you missed him; he’ll be back again soon. Keep an eye on Drake’s Diary for details. You can follow the discussion on St Crispin’s sole by entering your email address in the box below. You will then receive an email every time a new comment is added. These will also contain a link to a page where you can stop the alerts, and remove all of your related data from the site. I don’t think I’ve seen anyone do this with a Dainite sole. Very interesting. Is nice the way they worked the Dainite sole, but when trying to make a slimmer waist they have touched one of the stud holes. 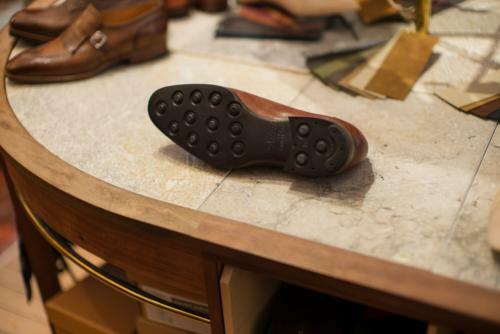 When the sole touches the floor it will show a hole. I know that shorter lengths for jackets today are popular, but in your opinion, how long should a suit jacket be?